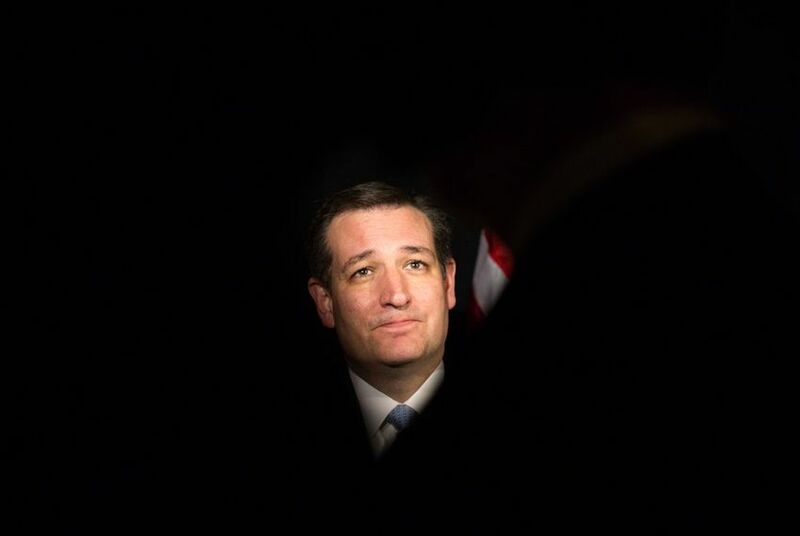 After All He's Said and Done, How Does Ted Cruz Return To The Senate? With his presidential campaign behind him, Ted Cruz will soon return to the U.S. Capitol and the job he was working so hard to transcend: rank-and-file senator. It will likely be hostile territory. WASHINGTON — With his concession speech behind him and his multimillion-dollar presidential campaign already winding down, Ted Cruz will soon return to the U.S. Capitol and the job he was working so hard to transcend: rank-and-file senator. It will likely be a striking re-entry. At times in recent months, Cruz appeared on track to land the nomination. But soon his campaign apparatus will fade away, as will the buses and traveling press corps. And come next week, he will be back to being just one of one hundred. And when he returns to the Senate with two and a half years left in his freshman term, he will enter hostile territory. There is no way around it: The actions he took over the course of his presidential campaign only further frayed Cruz's strained relationships with colleagues. This is the chamber where Cruz made a national name for himself by orchestrating a campaign to shut down the government, a campaign that many of his colleagues pleaded with him to abort. This is the chamber where Cruz once called his party's highest-ranking member, Majority Leader Mitch McConnell, a liar on the Senate floor. And this is the chamber where Cruz has an unusually disconnected relationship with his home state's other senator, John Cornyn, who said just last week that Cruz "came here to run for president." The moment most pregnant with drama will be when Cruz attends his first weekly lunch meeting with his fellow Republican senators. Since the outset of his Senate term, those closed-door gatherings have been the setting of the peak drama involving him. Now the room will be filled with the very people he spent the past year tarring as "the Washington Cartel." And their leader will continue to be McConnell, a man who, by all appearances, utterly despises Cruz. How will these senators react to his return? “People will applaud because they’re glad [the Cruz presidential campaign] is over,” said a Republican operative with ties to leadership. He spoke in jest, to be sure. But the comment was all the more striking given the panic settling into GOP circles once it was clear Tuesday night that Donald Trump will be the party standard bearer in the fall. Upon his return, Texas' junior senator could continue his role as the upper chamber's bomb thrower, or he could adjust his approach to work better with the leadership. It's a decision that may weigh on Cruz over the next few days: The Senate is currently on a home-state work period and won't get back to work until next week. So, how does he serve effectively? Several GOP operatives suggested to the Tribune that Cruz ought to zero in on a few specific issues he has long supported — a flat tax, a balanced budget amendment — and thereby make his legislative name in promoting conservative policies. But it is practically impossible to pass anything in the Senate without the support of other senators. Only three senators — Cory Gardner of Colorado, Lindsey Graham of South Carolina and Mike Lee of Utah — endorsed Cruz, even as Trump sent shudders through much of the Republican Party as all other viable contenders dropped off. Many senators remain reluctant to work with Cruz, Senate sources say, because they flat-out do not trust him. Repeatedly, a point of anxiety mentioned is how he handled a Pacific Rim trade deal last year. First, he backed the proposal via a Wall Street Journal op-ed he wrote with future House Speaker Paul Ryan. Two months later, he pulled his support on the morning of the Senate vote. One GOP consultant pointed to another former Republican second-place finisher as an example Cruz could emulate: U.S. Sen. John McCain of Arizona. Back in 2000, McCain was the anti-establishment firebrand in his presidential campaign against then-Texas Gov. George W. Bush. On the outs after losing the party's nomination to Bush, McCain spent the following years repairing his relationship with the president. Those efforts paid off in 2008 when he won the party's nomination. Falling in line with the GOP nominee, however, is not a calculation that will improve Cruz's relationships in the Senate. Trump's temperament — and his record of incendiary comments — terrify Republicans across the country. They are left with four options, none of which leave Republicans encouraged: supporting Trump, declining to vote in the presidential election, voting for a third-party candidate or supporting the likely Democratic nominee, former Secretary of State Hillary Clinton, herself a reviled figure within the conservative world. Furthermore, the McCain model is built on the notion that Cruz will run again in 2020 — a notion that every Republican interviewed by the Tribune for this story predicted he will do. Cruz’s political idol, Ronald Reagan, made a failed bid for the presidency in 1976, only to win in 1980. But first, he is up for re-election in 2018. The conventional wisdom at this point is that Cruz will run for another six-year term. It is hard to see how anyone ousts him in his home state. Texas shows few signs that it will be an opportunity for a Democratic pickup in a general election, and Cruz ran the table in nearly every corner of the state during his party's presidential primary on March 1. A second term could prove appealing to Cruz. Most obviously, it is hard to run for president as an out-of-office candidate. Former Texas Gov. Rick Perry struggled to raise money for his second presidential bid without the leverage of the Governor's Mansion. The Senate also gives Cruz a platform to play a foil to a potential Clinton or Trump presidency.